In the context intended for this presentation, “Gamebirds” are Galliformes. 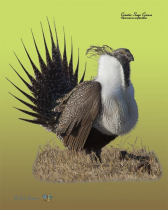 Species in this group include quail, pheasant, grouse, ptarmigan and turkey. Formerly known as "Valley Quail". There are seven recognized subspecies. 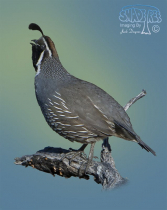 The San Quintin California Quail (C. c. plumbea) is the subspecies found in San Diego County. These bird's range is most of California, northwestern Nevada and the Pacific northwestern states, into Western Montana. 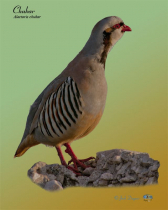 The Chukar Partridge is native to southern Eurasia from Israel to India. In the late 1800 these bird began to be released in the US and by the 1940's they were firmly established here. Also known as "Ring-necked Pheasant", this non-native bird is now widespread in the USA. Gambel's Quail can be easily confused with California Quail due to similar plumage, though their ranges do not overlap much. The Gambel's quail is native to the the desert south western USA and the northwestern mainland of Mexico. The California Quail's home territory is more west and north. These birds can be found in open sage country, from the great basin and into the Rocky Mountain states. During breeding season, the male Greater Sage Grouse gather in open grassland to posture and pose in hopes of attracting mates. 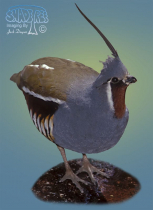 The Mountain Quail is a shy bird. Often the only way to know their presence is by hearing their calls. True to it's name, these birds prefer higher elevations from California and north through Oregon. Trusting in its camouflage, the Spruce Grouse commonly allows close approach. This behavior earned it the nickname of 'fool's hen'. The home range of these birds is most of Canada, Alaska and a few areas in the northern USA. They feeds largely on the needles of spruces and other conifers. The Wild Turkey is the heaviest member of this group. The native range of this bird is in areas of mature forests. They occur now occur in every one of the 'lower 48' states, though reintroduction steps may have 'introduced them to areas where they had not occurred before (e.g. San Diego County). The Willow Ptarmigan is non migratory. In winter, they attain all white plumage and tough out the cold arctic weather. 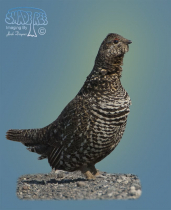 Called "Willow Grouse" in Europe, this bird is found in arctic or subarctic areas in North America and Eurasia.